be sour, else the batter will not ferment. Let it soak overnight or for 7-8 hours. 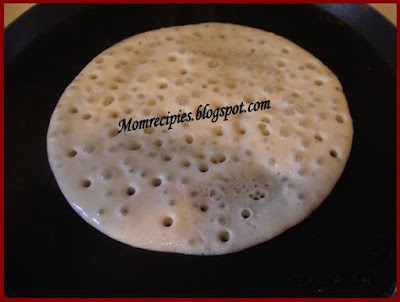 2)Then next day grind it to a fine paste without adding much water.Do not add too much water just add enough water to grind.See that batter should be thicker then dosa batter. 3)Remove in a vessel and add the salt and baking soda and mix well. 4)Keep it for 12 hours or overnight for fermentation. 5) Heat griddle or tawa in medium heat, cut onion into half and rub on griddle( This makes dosas to come off without sticking to pan )Pour a laddleful of batter. DO NOT SPREAD, and let it cook gradually over medium heat.No need to spread it as it is a thick and fluffy type of dosa. 6)Keep it covered and after a few seconds pour a little oil around the edges of the dosa and cover it again till it is cooked. 7)After a few minutes, turn the dosa. Keep it covered again. 8)Remove when both sides are done or till it is slightly roasted. Serve hot with coconut chutney , tomato chutney ,allam pachadi (Ginger chutney) or saagu. the set dosa is an amazing Indian Snacks, looks yum. Hi Sireesha,today i made this set dosa.It turned out great.very soft and spongy..myself and my hubby enjoyed these them alot.Now onwards i'm gonna follow the same recipe for "set dosa".